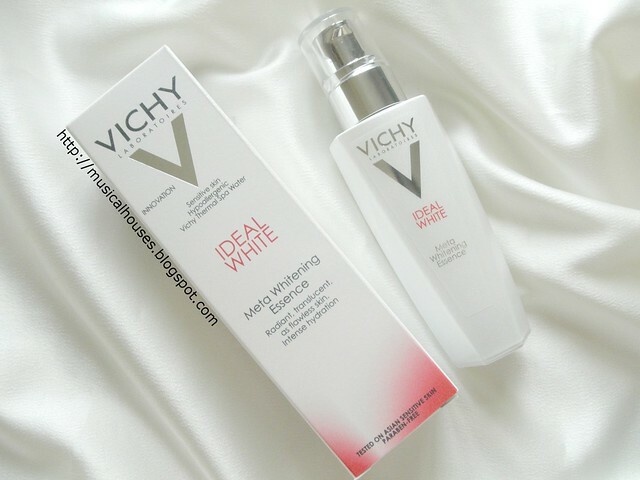 Vichy's Ideal White range of skincare is quite possibly the brand's biggest launch this year, and, as the name "Ideal White" suggests, this is a range that aims to brighten and even out the skintone. 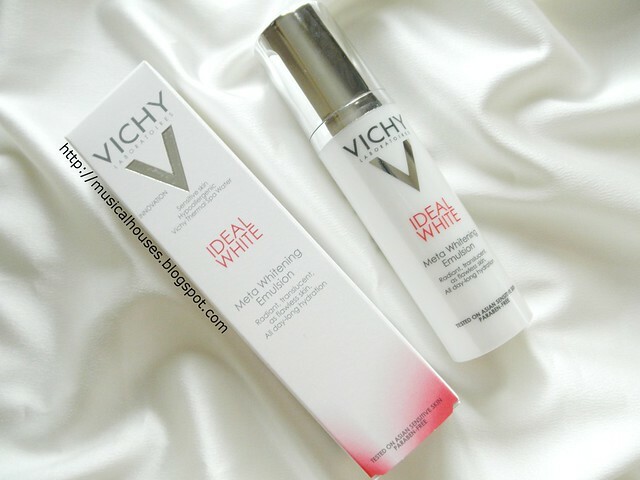 Vichy claims that Ideal White is a "holistic whitening range with exclusive whitening complex to correct melanin dysfunction for spotless skin with healthy rosy glow", and the range is indeed holistic - they do have an impressive array of products, from sunscreens, to essences, emulsions, eye creams, and spot products. So whether you're looking for something targeted, or whether you want to build your entire regime out of a single range, I guess there's something for everyone! 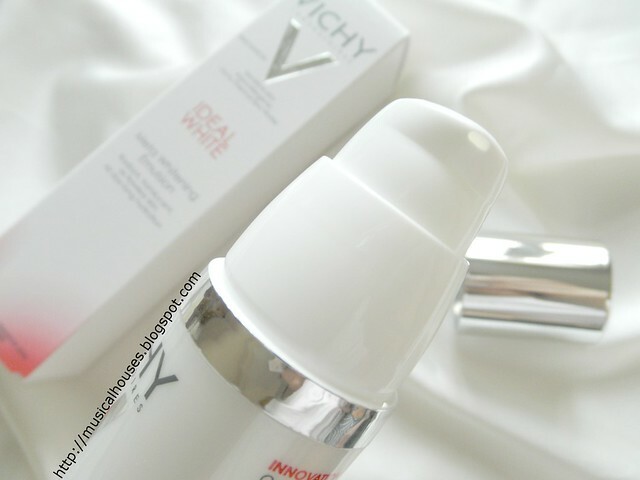 Vichy's Ideal White range apparently also comes with some novel technology behind it that gives the product its whitening and brightening properties. The featured ingredients in the range are resourcinol, which I'm told is supposed to be more effective than Vitamin C at whitening, Ellagic acid for exfoliating, and Adenosine for anti-wrinkle properties. I'm told that you would need about 1-2 months to show some effect on the skin. That does sound pretty exciting, doesn't it? I've got the Ideal White Meta Whitening Essence and Meta Whitening Emulsion to review, and of course we'll start off with the ingredients list for both products! 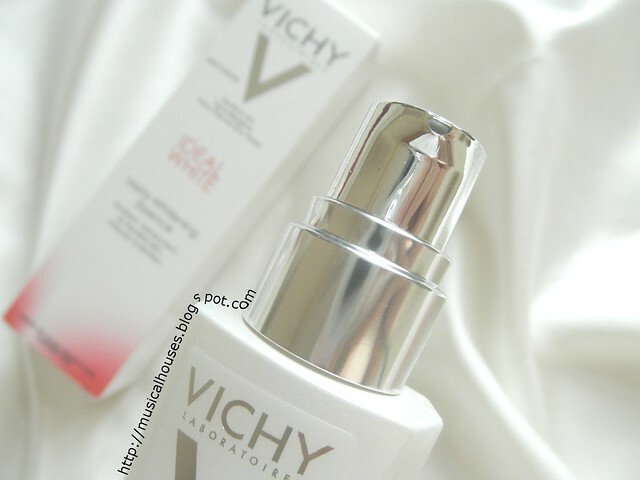 Vichy has also been very kind to answer some of my burning questions about the formulation and the ingredients of the products, so for those looking for a more in-depth exploration of the product, I hope this post will be what you are looking for! Since this is going to be a bit more meaty than my typical product ingredients review (read: it's friggin' long, people! As if my usual reviews weren't wordy enough! ), I'll start this section of my review by taking a brief look at the ingredients in both products, then taking a look at the published science behind the three key ingredients that Vichy is using in the Ideal White product range (Resourcinol, Ellagic Acid, and Adenosine), and then I'll run through some of the questions I had about the formulas of both products, as well as Vichy's responses to me. Let me first say that I really appreciate Vichy taking time out of their busy work schedules to respond to the questions of a mere blogger - first of all, they certainly have better things to do, and secondly, answering questions about ingredients and formulas can be quite a pain to answer, as compared to the usual "should I use this product before or after my moisturizer? "-type of questions brands normally get from bloggers. I won't publish their answers to me word-for-word (although I think their answers are good enough for me to do so), because I understand that not all the information given to me is public (some of it, like their own studies, are confidential), so I will just summarize their responses. 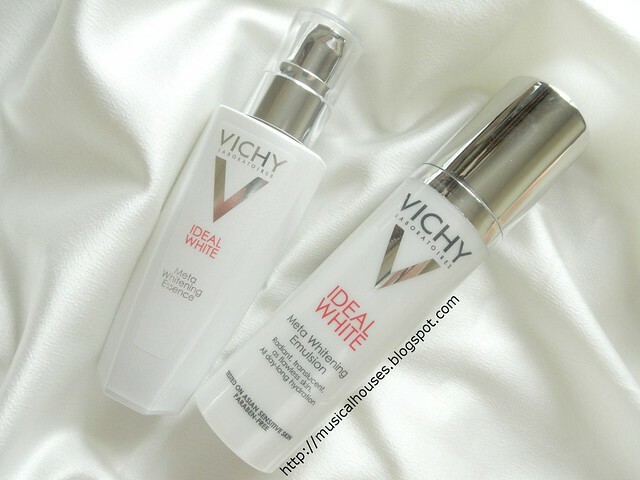 First: Let's look at the ingredients in the Vichy Ideal White Essence and Emulsion! Alright, that was a long enough introduction! 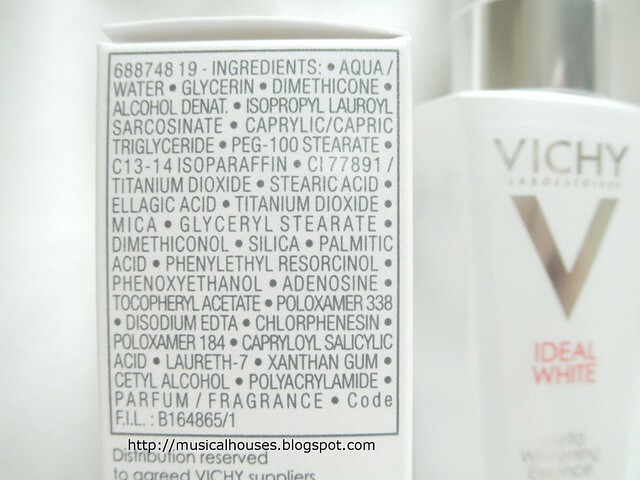 Let's start by looking at the ingredients in the Vichy Ideal White Essence! Of course, there's also the key advertised ingredients Ellagic Acid, Resourcinol (here listed as Phenylethyl Resorcinol), and Adenosine. We'll go into the science behind those ingredients in just a little bit, so stay tuned! There is also Capryloyl Salicylic Acid. Of course, you will also notice that there is Alcohol Denat. pretty high up in the ingredients list, as the 4th ingredient in the list. Alcohol in products is generally used either as a penetration enhancer, or else to thin out products that are too thick. Here, I'm guessing it's probably a penetration enhancer of sorts, because the formulation of the product doesn't seem particularly thick or heavy. While alcohol is actually pretty common in skincare products, some people avoid it as it can be drying and rather disruptive to the skin barrier in large amounts, so this might be a concern for some. As you might guess, I did surface this question to Vichy, and we'll see what they say in a bit. 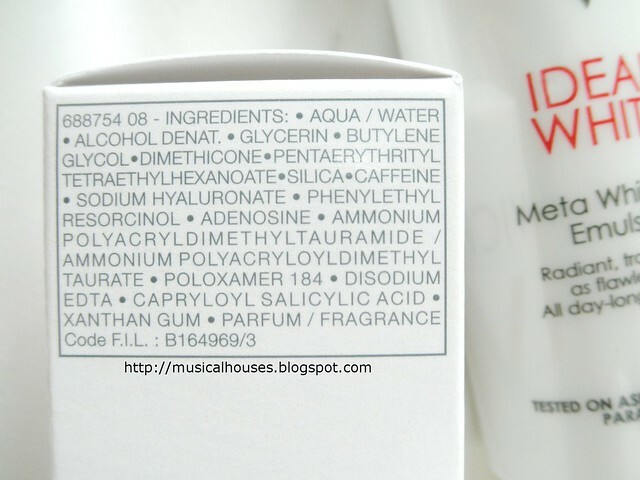 Let's move on to the ingredients in the Vichy Ideal White Meta Whitening Emulsion next! As you might guess, since these products are in the same range, the formulation for both products bears some similarities, although they aren't identical. Again, the Vichy Ideal White Meta Whitening Emulsion consists mainly of water, humectants (Glycerin, Butylene Glycol, Sodium Hyaluronate), an emollient (Pentaerythrityl Tetraethylhexanoate) which also doubles as a viscosity controlling agent, and other functional ingredients such as absorbents, stabilizers, thickeners and emulsifiers (Silica, Ammonium Polyacryldimethyltauramide/Ammonium Polyacryloyldimethyl Taurate, Poloxamer 184). There's also Caffeine, which is often included in slimming products, and can have anti-oxidant properties. And again, we see some similarities in terms of the key ingredients - here there is Phenylethyl Resorcinol and Adenosine, although we don't see Ellagic Acid. We also see Capryloyl Salicylic Acid, too. There is also a fairly high concentration of Alcohol Denat., which is the second ingredient this time round. I thought it would be interesting to mention Capryloyl Salicylic Acid, which is also present in the Ideal White range, although in smaller amounts. I won't actually spend too much time on this (because this post is pretty long, but also because I've written about it before), but this is a form of salicylic acid that has skin conditioning as well as exfoliating and anti-inflammatory properties. Capryloyl Salicylic Acid seems to be available mostly in other L'Oreal brands (although not exclusively), and appears in other L'Oreal product lines for blemished or imperfect skin, including Vichy's own Normaderm range, that I've reviewed before. So we can see some commonalities across the formulations of both the Vichy Ideal White Meta Whitening Essence and Meta Whitening Emulsion - there are both humectants and emollients, which cover the basics of moisturizer functions, and there are the featured ingredients Ellagic Acid, Phenylethyl Resorcinol and Adenosine, and there are similar concerns for both products - mainly the fairly high content of alcohol in both products. We'll look at what the sciences says about the featured ingredients next, and then go on to address some of the questions I had about formulation, thanks to Vichy's answers! So, with that in mind, let's take a look at what the published science says about these three ingredients! Let's start off with Ellagic Acid. It's primarily known as an anti-oxidant, and most of the research is not topical (i.e. on the surface on the skin, in the case of skincare), but more of ingested or other forms of Ellagic Acid, and explores its anti-oxidant activity. In terms of topical studies, there are some studies conducted on rats, where Ellagic Acid was found to alleviate skin wrinkles and inflammation, and also had anti-inflammatory effects when tested on rats' paws, and again anti-inflammatory, antinociceptive effects in rats. In humans, there are fewer studies, but some look promising, for example a topical microemulsion of pomegranate (Punica granatum) extract was tested on Asian skin, and found to have a significant impact on skin erythema and melanin, which the researchers attribute to the Ellagic Acid in the extract. There was also a study where a product containing 0.5% ellagic acid and 0.1% salicylic acid was compared with products containing 4% hydroquinone, and found to have comparable efficacy in reducing hyperpigmentation and dark spots, and another study using a novel hydroxyphenoxy propionic acid, ellagic acid, yeast extract, and salicylic acid was compared to the standard prescription combination of 4% hydroquinone cream and 0.025% tretinoin cream, and found to have comparable efficacy. So there is some evidence to indicate that Ellagic Acid could have whitening, anti-oxidant, and anti-inflammatory properties. Let's move on next to Phenylethyl Resorcinol. Phenylethyl Resorcinol is actually an ingredient developed by Symrise, one of the major specialty chemical suppliers that manufacture ingredients for the personal care industry, under the tradename SymWhite® 377. Symrise claims that Phenylethyl Resorcinol was "synthesized and screened for tyrosinase inhibitory activity as well as for antioxidant efficacy". Symrise also claims that "In many in-vitro tests SymWhite® 377 was the most potent ingredient among all the compounds investigated. The tests also showed that the effect of SymWhite® 377 was not due to cytotoxicity. Additionally it exhibits very potent antioxidant activity. An ex vivo study using human full-thickness skin explants was used to evaluate the efficacy of SymWhite® 377 in a more relevant situation and showed a significant improvement after 6 days. Finally, a clinical study with Asian subjects proved that 0.5% SymWhite® 377 is a more effective solution for brighter skin than 1.0 % kojic acid." But what does the published science say about Phenylethyl Resorcinol, beyond Symrise's own marketing spiel? I guess Symrise has not published most of its research, because my searches in PubMed didn't really throw up that much - in fact I found less than 5 studies dealing with the topical use of Phenylethyl Resorcinol for whitening. Most of the studies looked at Phenylethyl Resourcinol as a whitening agent, but all of them looked at mixtures of Phenylethyl Resourcinol with other ingredients, rather than just Phenylethyl Resourcinol alone. One study looked at a mixture of disodium glycerophosphate, L-leucine, phenylethyl resorcinol, and undecylenoyl phenylalanine, and found that signs for uneven skin tone including melasma area and severity and appearance of lentigines significantly decreased by up to 43% after a 12-week treatment period, while another looked at a combination of disodium glycerophosphate, L-leucine, phenylethyl resorcinol, and undecylenoyl phenylalanine, and found that mottled hyperpigmentation decreased by 32% after the 12-week treatment period, and that the product was well-tolerated by skin. Yet another study looked at a combination of a retinoid (retinaldehyde), a new phenolic agent (4-(1-phenylethyl)-resorcinol) and a reducing agent (δ-tocopheryl-β-D-glucopyranoside) and found significant improvement in the depigmentation of solar lentigines after 3 months. So although there are some quite severe limitations with the published research: for example, we don't know the percentage of Phenylethyl Resorcinol used, and we don't know how it is when used alone (although Symrise itself recommends that it be used in percentages of 0.1% to 0.5%). But I guess it seems like it has potential as a whitening agent for now. That said, one last study noted a case of allergic contact dermatitis caused by phenylethyl resorcinol, so I guess although the previous study indicated it was well-tolerated, everyone's skin is different. Let's now move on to Adenosine, the last featured ingredient. Again, I couldn't find that much research showing Adenosine in a context of topial application, but it seems like it is generally touted as having anti-oxidant and anti-aging activities. There was a patent filed for a composition reducing one or more of wrinkling, roughness, dryness, or laxity of the skin, containing adenosine, where the concentration of adenosine is "preferably 10−3 M to 10−7 M, more preferably 10−3 M to 10−6 M, and most preferably about 10−4 M", because "adenosine stimulates DNA synthesis, increases protein synthesis, and increases cell size in cultures of human skin fibroblasts." There are also patents for topical compositions containing 5'-adenosine-diphosphate ribose in skincare compositions too. 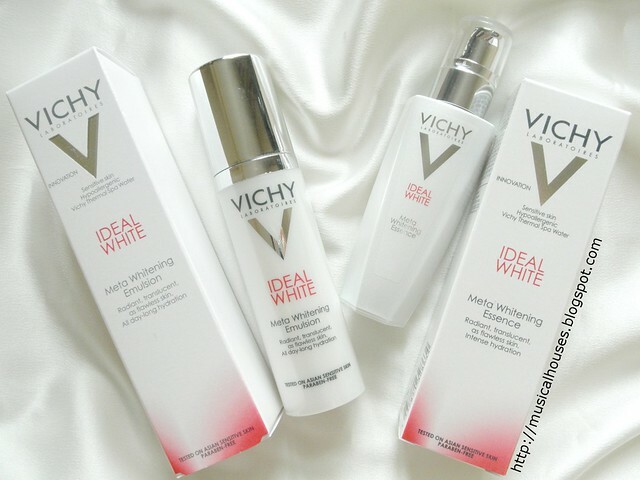 So there we have it - a fairly decent (I hope) summary of the three key ingredients in the Vichy Ideal White range! I think it's pretty cool when brands are willing to accept and answer questions, and even cooler when they get back to me. Like I said, answering the kinds of questions I ask can be a pain (especially when other questions asked are probably along the lines of, "If I have oily skin, is the Emulsion or the Lotion better for me? "), so I really appreciate the effort and time that went into providing answers. Like I mentioned earlier, I won't copy-paste their answers to me word-for-word, because some of the information, especially on their own scientific studies, are confidential, so I will just do a broad summary. As you might guess, one of the first things I asked was about the amount of alcohol in both the Meta Whitening Essence and the Meta Whitening Emulsion. The response I got was that while the company couldn't explain more about the amount of alcohol in the formula, I was assured that all the Ideal White products were "tested on Asian sensitive skin" and "hypoallergenic", and "with fortifying, soothing and regenerative Vichy Thermal Spa Water". So I guess that's meant to reassure us that the products won't trigger any skin sensitivities. Another question I asked was about about the active ingredients, and whether they were effective at the fairly low percentages they seemed to occur in (if you've looked at the ingredients lists, you'll know the three key ingredients are typically a little further down the ingredients lists). I was told that part of what made the Ideal White range different was that up to now, "most of the whitening products in the market focused only on the melanocyte, in the epidermis. The new Ideal White range showed that Vichy have considered the entire melanin environment", including the dermis, and external factors in pigmentation disorders, and that beyond percentages of ingredients, "the effectiveness of a treatment is linked to the association of different active ingredients". I was also told that the Meta Whitening Complex was tested in "stringent clinical trials" and "produced impressive results and was shown to help Asian women achieve the three-dimensional – flawless, translucent and radiant – skin". They also shared some results of their own studies, showing that there was improvementn in skin quality (more even, fresher, transparent brighter), skin tone colour (yellowish complexion was reduced, pinkish complexion was improved, and there was greater skin transparency), and spot correction (decrease in dark spots, surface spots, and spot density). They also shared that resourcinol acts on tyrosinase, the enzyme responsible for melanogenesis, which is also supported in this published review mentioning resourcinol as a tyrosinase inhibitor, and shared that it acheives significant melanin reduction even at low concentrations, thus aiding in skin brightening and evening. Vichy also shared that "certain ingredients, when formulated together have better effects", and that the combination of active ingredients, as used in the products, further improves the effect of the product on skin. That's basically the gist of what was shared with me, and I found that it was certainly useful in establishing why the product can perform effectively even when the key ingredients, from a cursory glance at the ingredients list, seem to be further down the ingredients list. It goes to show that a good combination of efficacious ingredients could potentially still be effective even at lower concentrations. Fourth: Can we move on from this ingredients analysis thing already? With that said and done, let's move on to the rest of the product review - my personal experience with the product. Both the products are in pump form, which you've seen in the photos above. I personally love products packaged in pump forms - not only is it more hygienic and less fussy, it also makes sense if your product is formulated with antioxidants that need to have minimal exposure to air and light to continue being effective. In this case, since the Vichy Ideal White range does have a bunch of antioxidants (Ellagic Acid., Adenosine, Phenylethyl Resorcinol, Caffeine etc. ), I'm glad that they chose a pump packaging for the Essence and emulsion. I can't count the number of times I've seen products containing antioxidants packaged in jars, so kudos to Vichy for sensible packaging! 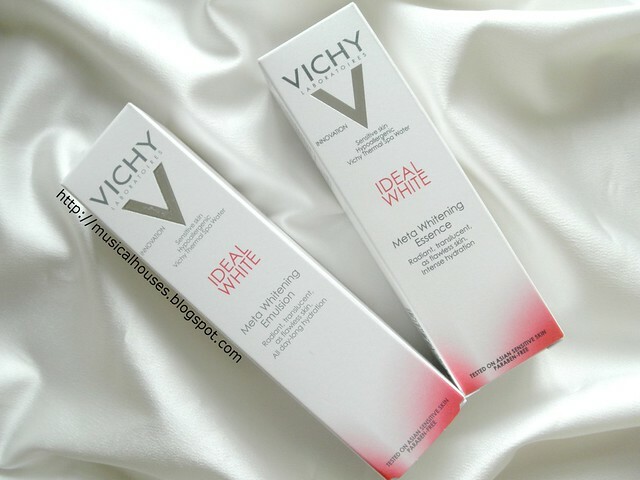 The Vichy Ideal White Metal Whitening Essence has a light, floral scent that dissipates fast. It is an opaque white gel that feels light, sinks in fast, and leaves very little residue behind on the skin. It alos has a slight has pink pearlescent effect (from the Mica in the product) and titanium dioxide, an opacifier that is white in colour, which gives an "instant whitening" effect on the skin. If you're looking for a product that gives an "instant brightening" optical effect, then you'll probably like this product the best! The Meta Whitening Emulsion is also a light-textured white gel, too, and like the rest of the Ideal White range, sinks in fast, again with very little residue. It also has a light powdery scent that dissipates. Both the Essence and the Emulsion are meant to be used together, but I guess depending on your routine, you might opt to use only one or the other. They both sit nicely under makeup, too, since they don't leave much residue behind on the skin, and they also don't seem to ball up and peel under other makeup like some other emulsions and essences do. When I used the products, I did find that the overall tone of my skin seemed to improve overall too. So, would I recommend the Vichy Ideal White Essence and Emulsion? If you're looking for a line of whitening products with novel ingredients and research behind it, then this would be a good choice, since the combination of Ellagic Acid, Resourcinol and Adenosine is pretty novel - there aren't too many products like it on the market. Also, if you're looking for something that is aesthetically pleasing - sinks in fast, leaves no residue - then this is also a really great choice. And Vichy's price points don't really break the bank either, so the products are fairly value-for-money. I think the only concern a consumer might have about the product might be the alcohol content, so although Vichy has indicated that their products have been tested on sensitive Asian skin, if you're still concerned, you might want to see if you can do a patch test before using the product. But otherwise, I think this is definitely something different in terms of whitening products, with an interesting formulation, sensible packaging, and a lightweight feel on skin. The Bottom Line: Vichy's Ideal White Emulsion and Essence have the novel combination of ingredients Ellagic Acid, Resourcinol and Adenosine to aid in skin brightening, are sensibly packaged, and don't break the bank. Thank you for the review. Where can I find those online? I am located in Greece and I doubt they will ever bring them here. @Aliki M: You might have to find a way to buy it online! As far as I know this is an Asia-only launch so far, unfortunately! Great article. Just picked up the Spot Intervention in Taiwan before coming back to the States last week. Worked immediately and still doing the trick. God, do you get paid for repeating yourself constantly?! Dude, I guess you forgot what an 'article' means...nobody asked for a thesis! I have oily skin, what should I opt? Essence or emulsion? @Unnati Singh: Both are fine for oily skin, they are pretty lightweight and don't feel heavy or oily on skin :) Either will work, so depending on what you want in your routine, you can go with one or the other. Thank you for your thorough analysis. I have just one question: the mica thing in the essence makes the essence sort of not a skincare product anymore? Because it's more like a lotion+primer (instant whitening effect) with the sparkling mica? I hesitated in buying it because I noticed the sparkling thing (although it would look good as a primer). @Unknown: You could think of it as a skincare product with a bit of sparkle :) The skincare properties are still there in the product, the mica just makes it look better on the skin. Hope this helps! I have ultra sensitive dry skin.I am an Indian. I have rashes also due to excessive dryness. My skin is damn sensitive. Will this work out for me? Am Indian. Very very dry skin. Sensitive too. And visible small red rashes on the cheeks. Does Vichy Ideal white Emulsion help me out?? @Anonymous: Vichy claims that the products have been tested on sensitive skin and are safe, so chances are they should be fine. But, depending on how sensitive your skin is, there's always a risk, especially with the alcohol content in the product. So I would advise caution - maybe get a sample or order a product with less alcohol first to test. hey i am currently using a vitamin c serum. can i use this vichy emulsion over it? @shubhangi kaushik: Yes you certainly can, there isn't anything in particular that would make them incompatible. Hope this helps! Does it work on hyperpigmentation? @Anonymous: It could help with improving the overall complexion as that is what it is formulated to do, but if you have any specific medical concerns, it might best to seek the advice of a professional. i am planning to use a glycolic peel . but i use vichy ideal white emulsion onto my skin daily. can i stiil continue use it after my peel? @shubhangi kaushik: If your skin isn't sensitive or dry and if you've built up a tolerance to the peel, then I don't see any issue, but, usually after an acid peel I recommend using products that are more gentle on skin to prevent irritation. It's best to check in with your dermatologist if you have any doubts though! Hi, can I use Vichy ideal white as a night cream? @Kans: You can if your skin type isn't too dry. There isn't anything stopping you from using it as a night cream. Hi. I had pox 1month before. I hv marks on my faces. Using Vichy ideal white deep whitening spot intervention will reduce it? I have chicken pox 1 month before. Using Vichy ideal white deep whitening spot intervention can help to remove marks? I have just bought the 89 mineral booster and the oil in water essence from Vichy as well. How do you think this should be used in conjunction with the ideal white range. Can I alternate between these 2 products or do I have to use both together with the ideal white range? @Unknown: You can certainly use the products together and layer them however you like! Generally a good rule of thumb is to layer products from the thinnest to the thickest in texture, but of course you can experiment and see what you like best. Hope this helps!